The Promised Flapper; Well Worth the Wait? As you read this, I will likely be photographing Ospreys on Lake Blue Cypress with Jim Neiger and our Friday group of 3. This post marks 133 straight days with a new educational blog post. With so many folks getting in the habit of using our B&H and Amazon links why quit now? To show your appreciation for my efforts here, we do ask that you use our the B&H and Amazon affiliate links on the right side of the blog for all of your purchases. 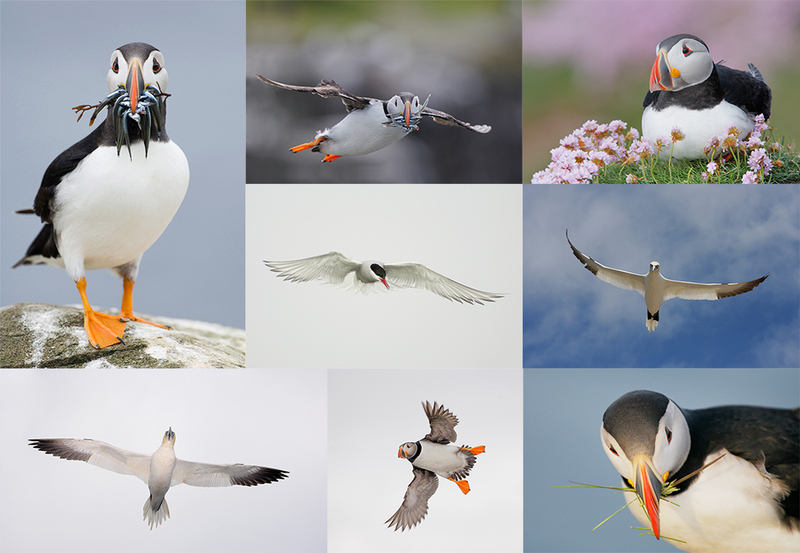 Please check the availability of all photographic accessories in the BIRDS AS ART Online Store, especially Gitzo tripods, Wimberley tripod heads, and the like. We sell only what I use, have used, and depend on. We will not sell you junk. We know what you need to make creating great images easy and fun. And we are always glad to answer your gear questions via e-mail. This blog post took only about 1 1/2 hours to put together. Enjoy! This flapping Wood Duck drake image was created at 3:38pm in late afternoon sunlight on January 17, 2014 on the San Diego Short Notice IPT with the Gitzo 3532 LS carbon fiber tripod, the Mongoose M3.6 head, the Canon EF 600mm f/4L IS II USM lens, the Canon 1.4x EF Extender III (Teleconverter), and the Canon EOS-1D X. ISO 800. Evaluative metering +2/3 stop as framed: 1/1250 sec. at f/6.3 in Av mode. Color temperature: AWB. Central sensor/AI Servo Surround/Rear Focus AF as framed active at the moment of exposure. Click here to see the latest version of the Rear Focus Tutorial. Click on the image to see a larger version. Let us know what you think of the image. In yesterday’s blog post, several eagle-eyed Photoshop policemen pointed out problems with my optimized image. They did of course, have the advantage of seeing the original. It is always easier to spot processing imperfections when you know exactly where to look. Today they have a second chance. I will tell you that I did some substantial Photoshop work in two areas of this image. Do you see anything funky? Do let us know exactly where I went to work and I will tip my hat to you if you are correct. If you would like to be placed on the interested list, please shoot me an e-mail. 16 comments to The Promised Flapper; Well Worth the Wait? Artie, is the update to the San Diego site guide free for those of us who have purchased it? I’d very much be interested in that! While the removed stick was very easy to see on the previous post, there’s nothing nearly so obvious this time around, like usual. Oh, and this wood duck image is superb. All updates are free. I will get to it before next season. Wow what a splendid image ! Thanks for posting Guru. Why try and find fault with it? That is an awesome image, just love what is. One question, Wasn’t the white on the duck’s neck burned out on +2/3? I don’t think so. Reducing light would have darkened the awesome colors to a great extent and made them unclear. Gorgeous. 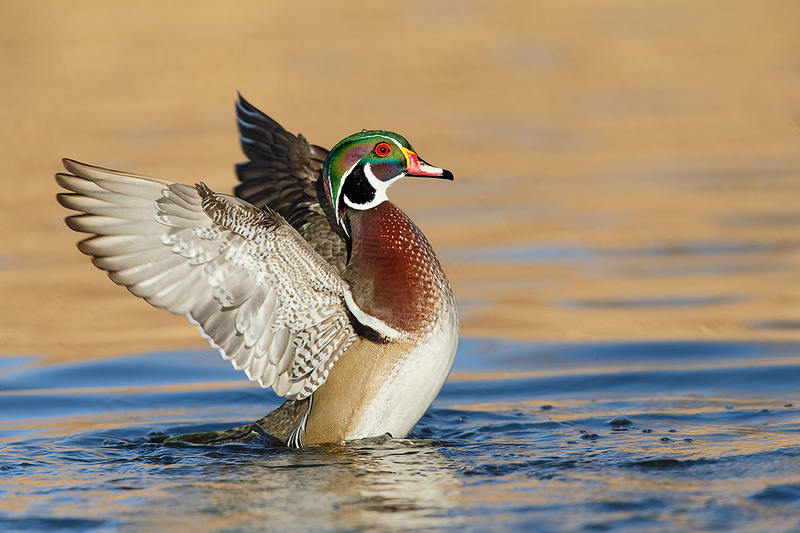 I dream of getting a Wood Duck image like this. Feels like a bit of CW rotation may be needed. Something funky in the gold area just above the blue, about mid-breast level at the far right, and perhaps that entire horizontal line from mid-breast to the right. Also maybe something near tip of outstretched wing at far left. I’m guessing the duck was not alone and you removed someone from to the left of the outstretched wing. On the righthand side it looks like some work was done about mid-breast (maybe there was a stick floating or some bubbles) and also in the upper right corner. I should confess that this isn’t exactly obvious; I inverted the image and tweaked the curves to bring it out. I will reveal this in a post. Keep reminding me. In case I forget, nothing at all was–despite many opinions to the contrary–done to the background. I did remove some ugly specular highlights from the dark mahogany feathers on the side of the upper breast.